If you are unfamiliar with Craig Zobel, google him immediately. Hopefully you’ll discover Homestar Runner, which will clue you into Zobel’s particular mad genius. Go ahead and spend some time. Take in the glory that is Teen Girl Squad. 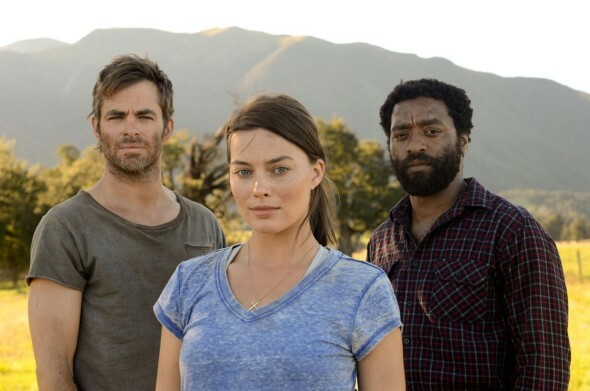 Then prepare yourself for an amazingly different experience and watch the filmmaker’s third feature, Z for Zachariah. Based loosely on Robert O’Brien’s award winning adolescent novel, the film is a meticulous examination of human behavior masquerading as a SciFi flick. Sometime after an undisclosed apocalypse (radioactivity suggests a nuclear war), Ann Burden (Margot Robbie) tends her farm alone, her valley somehow spared of the radiation. She believes she may be the last living soul until scientist John Loomis (Chiwetel Ejiofor) appears in the distance in his radiation suit. What evolves is a fascinating character study blessed with two excellent performances. Ejiofor is incapable of a weak turn, and as is always the case, he manages to wear the character’s entire backstory in his countenance, posture, wordless reactions, and eyes. He’s almost capable of presenting a fully realized character without a word of dialog, and his Loomis is a mysterious, weary guest whose undisclosed, recent experiences have made him a little distant, even as Ann has to contain her joy at finding a companion. Robbie has never been better in a role that is sometimes almost aggravatingly naïve, and yet this is a character with the grit to survive on her own, to plow a field – to create the film’s Eden. Nissar Modi’s screenplay sometimes treads too heavily with the biblical metaphors, but Zobel never does. While the film explores ideas of science versus religion, male versus female, intellect versus emotion, white versus black, Zobel’s real interest – as he showed with brilliantly frustrating results in his previous effort, Compliance – is to examine human foibles, resilience, and self-destructive tendencies. Z examines the nervous but sweet blossoming of a relationship, then upends the comforting narrative with the arrival of a third survivor – handsome Caleb (Chris Pine). Pine’s third wheel is a less developed character, but the actor manages to convey the right amount of manipulative aw-shucks and just the hint of menace the film needs to generate tension. The film’s minimalism is both welcome and problematic, as it seems to work against much of the built-in tensions and drama that could enliven the running time. Fans of the novel will be irritated by the many liberties taken, but Zobel’s film stands firmly on its own. Told with realism and simplicity, and boasting an intriguing amount of ambiguity – especially at the climax – Z abandons the traditions of the post-apocalyptic film in favor of something modest and moving.